The quiet farming community of Whangaripo Valley is an unlikely spot for one of the world’s biggest motorcycling websites. But local Chris Hunter is considered by many to be a global expert on custom motorcycles. Brought up in small country town in Wiltshire, England, Chris had a lot to deal with as a kid. He was the victim of a medical accident which resulted in profound deafness at the age of two. He pulled a fresh pot of tea off a table which scalded him severely; the wrong antibiotic during the treatment damaged the nerves in his ears. A number of other burn victims at the time experienced the same dreadful result. His parents got him into speech and lip-reading therapy rather than sign language, and Chris credits this decision for the professional life he’s led. Before he started Bike EXIF, he was in advertising for over two decades; more than half of that as an award-winning creative director. Anyone who knows him would never think of him as disabled – the idea is almost laughable. “In reality, it was the best thing she could have done at that point,” he admits. “The work-hard, party-hard culture in London was becoming a health hazard.” They had three children, all three years apart, in Pt Chevalier and Laingholm, then work took them back offshore. During a four-year stint in Sydney, Chris bought a Vespa for his commute. He loved being on two wheels, and began to pay more attention to motorcycles. After passing his full licence test, he upgraded from the Vespa (which he still has a soft spot for) to a much more substantial machine—a beautiful white Moto Guzzi V7. That was 2009. Sitting at the kitchen table after work, Chris taught himself everything about blogs and how they worked; from the design and coding to writing (his particular strength) and search engine optimisation. Chris loved the buzz of Sydney, but Kathy grew homesick for rural life. So the family became part-time members of a 300ha farm cooperative an hour north of the city, on the edge of a national park. It was here that Chris had his first taste of farm life, animal husbandry and physical labour – chainsaws were a revelation! When it was time to move back to NZ, it was he who insisted they move to the country. He set about turning Bike EXIF into a thriving business driven by advertising and sponsorship income. Today, the site has become the go-to bible for custom fans everywhere. It now averages over two million page views a month, with a cult following in the USA, UK, Germany and France. The social media numbers are equally huge: over 400,000 Facebook fans, 250,000 on Instagram and a whopping 1.9m followers on Pinterest. (That’s nearly ten times as many as Oprah.) In the festive season, the annual Bike EXIF wall calendar is regularly the #1 moto publication on Amazon. Chris has also edited both editions of The Ride, a bestselling custom motorcycle coffee-table book from the Berlin art publisher Gestalten. (The New Zealand launch of the first book was at The Vivian Gallery in Matakana, as part of a high-end bike show curated by Kiwi bike racing legend Graeme Crosby.) Most recently, he’s launched an online shop – no bikes for sale, but a hand-picked selection of the most functional and beautiful gear any biker could wish for. On their lush 5 hectare lifestyle block in the Whangaripo Valley between Matakana and Wellsford, the couple raise half a dozen beef cattle every year. Kathy and teenage daughter Maddy ride horses over the neighbouring farms, younger son Tom thrashes his motocross bike around the paddocks, and there’s a motley collection of hens in the orchard. Eldest daughter Alex teaches drama at local schools. Chris is a slave to his dog, a blue heeler, and also adores their two cats, who return the sentiment. 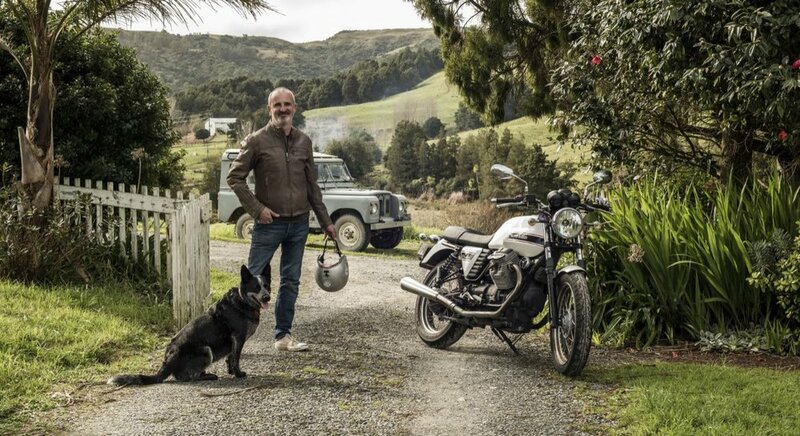 As well as the Moto Guzzi, he owns a beloved 1970 Series II Land Rover, and spends hours on a John Deere ride-on with a beer in hand, mowing the edges of their 800m driveway. While country life is enjoyable, it’s nicely tempered with regular invitations to attend, sponsor or judge motorcycle events around the world, with ‘Wheels and Waves’ in Biarritz in the south of France a regular stop on his global itinerary. He still literally works from the kitchen table however… usually with a cat on the keyboard and the dog at his feet.